Henry was born in Dallas, Georgia. He attended East Paulding High School in Dallas, and he played high school football for the East Paulding Raiders. Henry holds the school record for longest punt (66 yards) and led the Raiders to the state semi-finals as quarterback by throwing for 17 touchdowns and more than 1,700 yards. Henry accepted an athletic scholarship to attend the University of Florida in Gainesville, Florida, where he played for coach Urban Meyer's Florida Gators football team from 2007 to 2010. As a sophomore in 2008, Henry was a member of the Gators' BCS National Championship team. During his senior season in 2010, Henry punted 50 times for 2,253 yards (a 45.1-yard average), including his season-best punt of 75 yards. Sixteen of his punts landed inside the 20-yard line and only thirteen were fair caught. Memorably, Henry also assumed place-kicking duties when starting place kicker Caleb Sturgis was injured, and kicked the 37-yard, game-winning field goal in the Gators' 34–31 overtime victory over the rival Georgia Bulldogs while several Bulldog assistant coaches attempted to distract him from the sideline. Following the 2010 regular season, Henry was recognized as a consensus first-team All-American, and received the Ray Guy Award, awarded to the best punter in college football. He was one of three finalists for the award in 2009, and one of ten semifinalists in 2008. After he was not selected in the 2011 NFL Draft, Henry signed as an undrafted free agent with the Philadelphia Eagles. He opened the 2011 NFL season as the Eagles' starting punter. Henry committed a Monday Night Football blunder against the Chicago Bears in a Week 9 loss, in which he botched a fake punt, and his pass was underthrown. Henry was released by the Eagles on September 25, 2012. Henry was signed by the Buccaneers on February 13, 2013, and was competing for the starting spot against Michael Koenen. Henry was cut by Tampa Bay on August 31, 2013. 1 2 3 GatorZone.com, Football History, 2010 Roster, Chas Henry Archived April 2, 2012, at the Wayback Machine.. Retrieved May 19, 2011. ↑ 2011 Florida Gators Football Media Guide Archived April 2, 2012, at the Wayback Machine., University Athletic Association, Gainesville, Florida, pp. 89, 95, 97, 101, 136, 151–153, 182 (2011). Retrieved August 12, 2011. ↑ ESPN.com, College Football, NCAA Division I-A Player Punting Statistics, Chas Henry. Retrieved May 19, 2011. 1 2 Shannon J. Owens, "Florida punter Chas Henry wins Ray Guy Award," The Orlando Sentinel (December 9, 2010). Retrieved May 19, 2011. ↑ Chris Low, "Richt downplays Grantham's choke sign," ESPN.com (November 2, 2010). Retrieved May 19, 2011. ↑ Associated Press, "Mark Richt: Emotions got the best of coach," ESPN.com (November 2, 2010). Retrieved May 19, 2011. ↑ Antonya English, "Florida kicker Chas Henry wins prestigious Ray Guy Award," The St. Petersburg Times (December 10, 2010). Retrieved May 19, 2011. ↑ "Chas Henry Honored at the Home Depot ESPNU College Football Awards," GatorZone.com (December 9, 2010). Retrieved May 19, 2011. 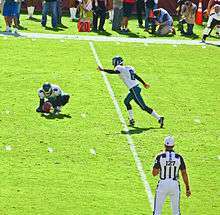 ↑ Jonathan Tamari, "Rookie kicker and punter stepping into key roles with Eagles," Philadelphia Inquirer (August 7, 2011). Retrieved September 2, 2011. ↑ Bo Wulf, "McBriar Returns As Punter; LS Added," PhiladelphiaEagles.com (September 25, 2012). Retrieved September 25, 2012. ↑ "Bucs Add Punter Chas Henry," Buccaneers.com (February 13, 2013). Retrieved February 13, 2013. ↑ ["http://tbo.com/sports/bucs/bucs-make-roster-cuts-put-tynes-on-injury-list-20130831/ Bucs make roster cuts],"